BEIJING, Nov. 3 (Xinhua) -- The Arctic has become a new area for the development of the Belt and Road Initiative as the "Silk Road on Ice" (SRI)becomes more feasible. Being made possible as melting ice gives way to open sea, the SRI refers to a shortcut between the Pacific and the Atlantic oceans through the Arctic. It is widely seen as the third arch of the Belt and Road Initiative, which is originally composed of one route spanning westward from China to Europe, and the other extending from the country's eastern coastline down to the Indian Ocean. On Wednesday, Chinese President Xi Jinping told visiting Russian Prime Minister Dmitry Medvedev that China and Russia should cooperate in the development and utilization of the Arctic routes to jointly build the SRI. This is not the first time the two leaders discussed cooperation in building the SRI. In his visit to Moscow on July 4, Xi agreed with Medvedev to jointly build a sea route through the Arctic Ocean into the SRI. The interaction between Chinese and Russian leaders sent a strong signal that the Arctic has gained a place in the Belt and Road Initiative. Earlier this year, the Chinese government released a plan for maritime cooperation under the initiative, envisioning an economic passage between China and Europe via the Arctic Ocean. In the plan, China pledged to support efforts to improve transportation conditions on the Arctic Ocean and encourage Chinese enterprises to take part in the commercial use of the Arctic route. The SRI will greatly enhance connectivity between China and the Europe and potentially the Americas, reshaping global trade flows, and consequently the world economy, Hu Angang, economics professor at Tsinghua University, told Xinhua. Compared to traditional routes, passages via the Arctic can be 30 to 50 percent shorter, cutting time, costs and fuel. They have great economic potential for the world, particularly trading powers such as China. As world's largest trader, China trades goods worth some 4 trillion U.S. dollars a year, 90 percent of which are transported by sea. Saving even a fraction of the transport costs can mean quite a significant amount. The Arctic routes will further drive global transport costs down by offering an alternative route to shipping companies, breaking the monopoly of some of the world's key waterways, such as the Malacca Straits and the Suez Canal. In addition to saving costs, the Arctic economic passage can help stimulate trade growth, Hu said. The Arctic routes link China with some of the world's most developed markets, including America, Canada and oil-rich states in northern Europe. Once the cost-efficient and time-saving routes became mature, they would spur China's exports of high value-added goods to these developed countries, he added. 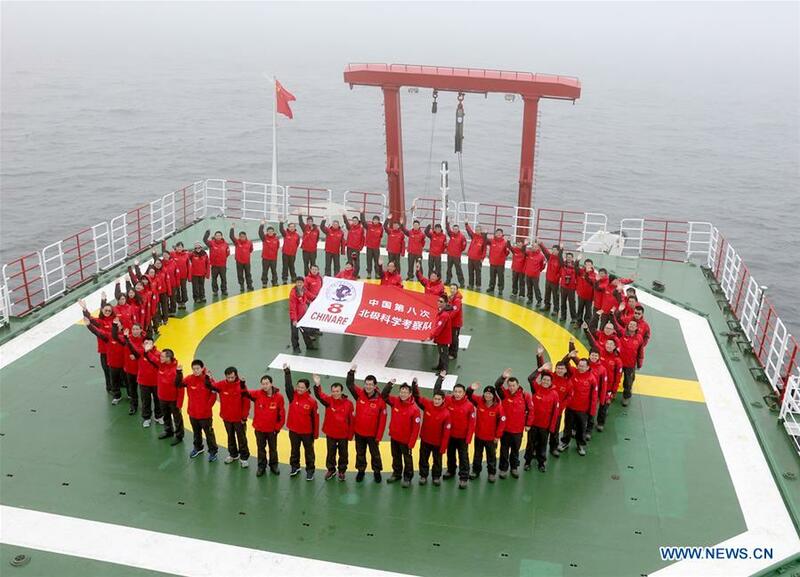 In September, Chinese icebreaker Xuelong, or Snow Dragon, crossed the Arctic through the Northwest Passage, a short cut between Asia and North America, during its Arctic rim expedition. It is the first time any Chinese ship completed that route. Meanwhile, China is building its second icebreaker the Snow Dragon 2. The domestically-built icebreaker is due to hit the ice in 2019. China has long ventured into the Arctic Ocean. In 2013, China COSCO Shipping Corporation, one of world's largest maritime carriers, sent a ship coded Yongsheng from northeast China's Dalian port to Rotterdam through the Northeast Passage, also known as the Northern Sea Route, across the Arctic Ocean. The voyage was completed in 30 days saving a third of the usual shipping time. Since then, COSCO has been sending multiple ships through the Arctic Ocean every year. These voyages can help accumulate navigation experience, which is valuable in developing a specialized talent pool as well as ships and facilities for the Arctic Ocean. At the moment, shipping through the Northeast Passage remains costly and challenging for lack of infrastructure. Maintenance is hard to find and extremely expensive for ships trying to edge through the icy waters. China will work with countries bordering the Arctic Ocean to build infrastructure, such as harbors, roads, bridges and communication facilities in order to improve connectivity and commercial feasibility of the Arctic route, Hu said. The Northeast Passage is the most commercially viable one of the three main routes that connect the Atlantic and the Pacific oceans via the Arctic. The other two are the Northwest Passage, and the Transpolar Sea Route. The Northwest Passage goes along the northern Canadian and Alaskan coasts, the Northeast Passage follows the Russian and Norwegian coasts, and the Transpolar Sea Route crosses the Arctic through the North Pole. At the moment, the Northeast Passage is the most feasible, allowing ships to pass for some 4 months. The passage, already in commercial use, is the one that China and Russia have vowed to jointly develop. The Northwest Passage is much more challenging with thick ice and complex straits. It still takes time for the passage to be feasible for commercial use. China has published a guide with nautical charts and descriptions of ice conditions on the passage. The Transpolar Sea Route, which crosses the North Pole, is theoretically the shortest route linking the Pacific and Atlantic oceans. However, passing through the coldest part of the Arctic, the route will not become feasible until the Arctic become ice free. Scientists have made varied forecasts as to when the Arctic will be ice free. Most predictions point to a period between 2030 and 2050.